Hi Tony. Hope you’re ok as not been on for a while. It’s probably too late now but you might have been able to help with this . Yep good to see you back Tony. Haven't been too good since New Year, so kept the internet down to a minimum, but a lot better last few days. Very sorry to hear the loss of another Blackpool fan, no doubt the funeral has taken place by now and in all honesty I am not sure I could have been much help. It has always amazed me the number of fans I have come across who had no connection with the town or club, lived miles away from Bloomfield road but never the less were fans. Back in 53 crowds were not segregated, yes we had our favourite places at home games and by and large at away games fans would tend to stick together but there was no segregation. The 53 final for me, meant a rather uncomfortable night 10pm until 8 am in my old mans sidecar of his motorcycle combination, before having breakfast on the outskirts of London at an all night transport cafe. I am not sure of exact numbers but a good few trains departed from Blackpool to London taking the bulk of the fans, motor transport was very limited in those days and the A roads passed through umpteen villages and towns, bypasses and motorways were for the future. Wembley meant so much to fans back then, for fans it was the ultimate prize to see their team play there and for Blackpool fans 53 was the third appearance within 5 years, surely this time they would win. We arrived at Wembley at noon that day to get a good spot, down at the front of the old West Terrace, (the end Cardiff fans had in 2010) and well before the match began we had bands playing and a guy on a platform leading the singing, I believe it was the band of the Grenadier Guards that year, although it could have been them in 51 come to think of it. Of course getting a ticket for Wembley was a major hurdle as I believe only an allocation of around 20-25k was allocated to each club and one of my uncles who lived in the Bolton area said that they restricted their allocation to people who lived locally, I have no idea how they did that but I can remember him telling me this at a later date. Most of the tickets around 50k were distributed to the football associations across the land, which was a pretty poor show seeing that half of Wembley were really neutrals, while many serious football fans of competing clubs could not get to see their team play what could be the most important game of their lives. Was the motorcycle anything like this? 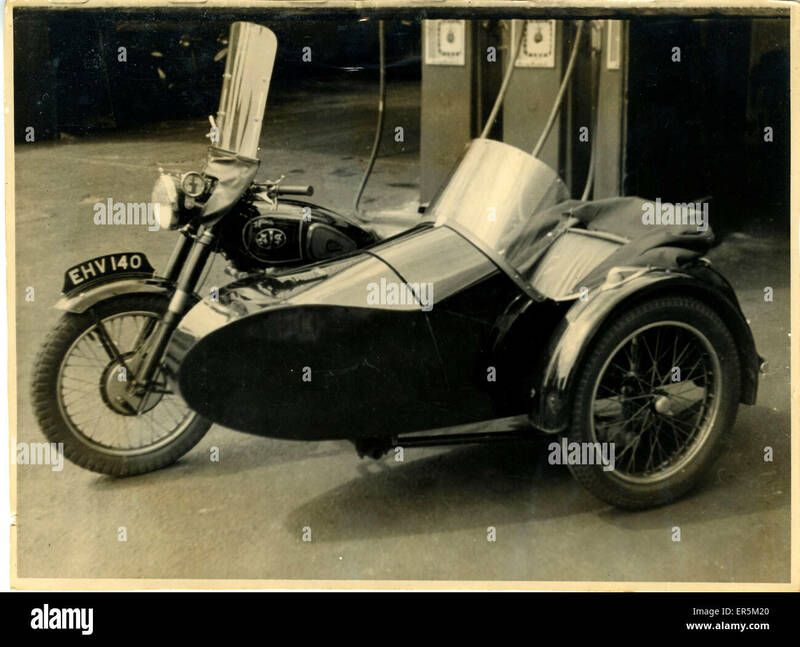 It was similar but the sidecar was enclosed with the roof lifting off and over the motorcycle and there was no heater it was bloody cold even in summer. Glad to have you back on here Whits. You’re posting style is very enjoyable to read. Have you ever done any professional writing? Whits always makes me wish I was born 50 years earlier. I was going to ask the same, you should write some memoirs, Whits! Magic only for certain things, following Blackpool f c was brilliant, the town was buzzing and it was a lot easier for youngsters to find employment, but on the downside the mentally ill were shoved into institutions, polio and diptheria and TB was fairly common, (we have come a long way in healthcare), unis are now not just for the well off and were would we be without the internet and 24/7 news worldwide. Suffolk, I believe our history is well known, whenever I speak to people I have never met in my life and the subject of football comes about and I tell them I am Blackpool fan, they all know about the 53 final, the two Stans and that we play in that rather unique coloured shirt of Tangerine.